As we have seen the contemporary official descriptions of the colour used to paint the Zero refer to a grey. The maintenance manual describes a "grey rat colour" and the Yoko 0266 report refers to "(J3) grey (ash colour) slightly towards amber (candy) colour". These descriptions may be taken to imply a warm, perhaps slightly brownish grey. The documents do not refer to Hairyokushoku (Grey green colour) although that was used by the Zero's designer Jiro Horikoshi to describe the colour of the prototype ("dimly shining ash green colour"). 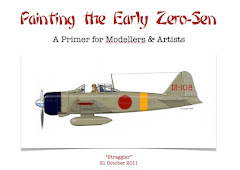 The Yoko 0266 document appears to be the only basis for the term "ameiro" (candy or amber colour) which has gained currency with some modellers and writers in describing the colour of the early Zero. As may be seen from the actual Yoko 0266 description the use of the term "ameiro" to describe the colour is misleading, although the report does go on to use it that way, presumably as a shorthand form of the longer description. The 'J' series, Hai iro (ash or grey colour), is usually represented as plain, neutral greys - mixes of black and white only, but some Japanese researchers maintain that the original appearance of J3 was slightly greenish. The nature of neutral greys is such that dependent upon illumination they may appear slightly blueish. J3 is a colour which attracts considerable interest and discussion in Japan, with some researchers maintaining that it was used as the factory finish of the Zero. 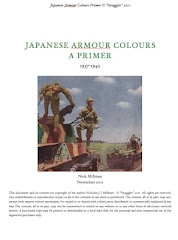 Recent research into Japanese paint chemistry development during the war suggests there may have been added pigments to the original J3 metal paint leading to the slight ambering of the colour. I think it more likely that the warmth or "brownishness" of the paint arose from the inherent ambering effect of the binder as well as the use of drying and levelling additives long associated with Japanese paint techniques. Kariki 117 includes grey green as series 'M'. Recently this series is being referred to more often as "sage green" even though that is not the term used in the actual document - which is Hairyokushoku. Gaia paints used the 'M' series for their Zero colour although some Japanese researchers maintain it was only intended for interior paint. At least one wartime description refers to a flight of Zeros as being "soft, pale green" in colour. Nezumi iro (rat or mouse colour) is also included in Kariki 117 as the 'L' series. Ryôichi Watanabe has compared L2 to FS 16350 which is a value also frequently matched to extant Zero artifacts. But another Japanese researcher compares it quite differently. One of the problems associated with the Kariki 117 colours is that they appear so far to have been matched only by visual comparison (subjectively) and the matches are in some cases contradictory or inconsistent. Finally, mention must be made of the 'I' series of colours, Tsuchi iro (earth or clay colour), which was announced as the factory paint colour for the Zero by James F Lansdale a few years ago, based on the comparison of extant Zero artifacts to the facsimile Kariki 117 chips. In an article in Arawasi magazine Watanabe-san commented that I3 was used as a second coat of paint on Zero fighters, presumably as the surface finish over the red primer (?). However at least two other Japanese researchers maintain that I3 was a middle coat and that a surface coat of J3 was painted over it. They suggest that the oxidisation or "chalking" rubbed away to reveal the I3 colour on extant artifacts is actually a degraded J3 topcoat. The problem with this argument is that artifacts taken and preserved from aircraft which did not exhibit the oxidisation or "chalking" (e.g. relatively new and/or unexposed aircraft) appear to be painted in the olive grey colour. The exact colour value of I3 does not appear to have been nailed down, with Japanese researchers providing different matches for it. Watanabe-san compares I3 to Munsell 2.5 Y 6/2 which is a light brown similar to FS 20318. The FS value is slightly more "pinkish" whereas 2.5 Y 6/2 is slightly more greyish. 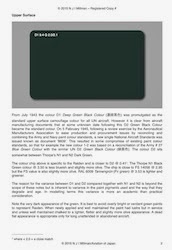 However, another Japanese researcher compares I3 to Munsell 5 Y 5/2 which is a light olive drab colour similar to FS 34201. The latter value is often cited as a match to the current paint surface appearance of Zero artifacts which is where the conclusion appears to arise. For some 34201 seems much too dark, too brown and too like an olive drab to be realistically envisaged as the colour of those early Zero fighters. Whilst the difference in hue or lightness of the fabric control surfaces of Zero fighters is apparent in some monochrome photographs and has been proposed as an actual hue difference from the examination of artifacts, no explanation or reason for this difference has been established. We are asked to believe, from the extant artifact evidence, supported by those monochrome photographs, that whilst the main metal airframe of the Zero was painted at the factory in a colour now described as "olive grey", in effect a khaki or light olive drab, the fabric control surfaces were painted in a neutral grey. In one discussion about this the apparent differences in the metal and fabric surfaces of the B-17 were cited, presumably to somehow corroborate the proposal or to reinforce the Japanese practice. However, this evidence is flawed. The B-17 was painted entirely with coatings described as "olive drab" and the difference, long presumed to be a different rate of fading on fabric as opposed to metal, may have had more to do with the coating formulae and application methods - which were different. The same could be true for the Japanese Zero; that the paints applied to metal and fabric were intended to be the same in hue, but were applied using coatings of different formulae and different methodology, therefore appearing of different lightness at the time (and thus appearing that way in photographs). Over time a possibly radical departure in hues from the long-term ageing and molecular degradation of the differently applied coatings has resulted in a modern belief that one was originally like an olive drab and the other a neutral grey. In accepting this belief the application of Occam's Razor immediately raises the questions "Why would the Japanese do that? What was the purpose?" "The rudder has apparently been finished originally in a Sky (Pale Green) color, but this was not characteristic of the balance of the aircraft, where grey dope has been used. 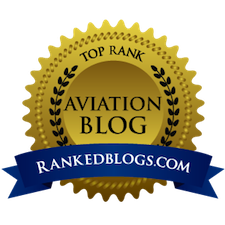 This might indicate that the rudder was not part of the original aircraft assembly, and had been recoated, or, alternatively, that some chainge of their color programme was made during the original assembly of this aircraft." "In the case of the aircraft examined from an inspection of the dope stripped from the fabric, it can be seen that this component had apparently been refinished as the original color is somewhat similar to our camouflage shade known as "sky". The latter application being a grey." 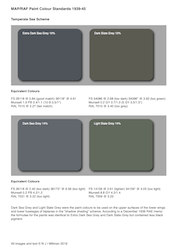 The preponderence of contemporaneous descriptions of "grey" may seem problematic for the modern conclusion of "olive grey" (khaki or light olive drab) from the artifacts, but has been explained by the catch-all of the characteristic "chalking" or oxidisation of the paint surface, shifting the appearance from the original "olive grey" to a more neutral looking or slightly blueish grey. This oxidised surface, it is argued, is what contemporary observers were seeing. It seem we are on shifting sands and that the various viewpoints may be too unequivocal in dismissing or ignoring those factors which do not conform to their arguments. The concession that the current paint surface appearance of the artifacts may not be their exact original colour has been made (and confirmed by at least two scientific reports relating specifically to examination of the artifacts) but unfortunately the lure of their present and tangible colour has led some modellers and artists to make no attempt to try to envisage this difference but instead to take the modern appearance and even the FS 595b close values too literally and to replicate them on models and in illustrations. The result is a widespread belief amongst Western modellers that early Zero fighters were essentially "brown" (those who have rejected this idea have stuck more to the archaic "whiteish grey"/"off-white" belief epitomised by the painting). 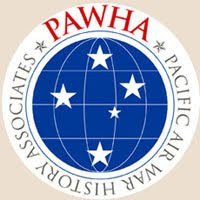 This has not happened in Japan, where evidence beyond the smoking gun of the artifacts is more widely available and accepted, including the collective folk perception of 60+ years of multi-media description, artistic representation and memory associated with an aircraft of iconic national importance.